We watched Frosty the Snowman the other night and thought it would be cute to create him for breakfast. 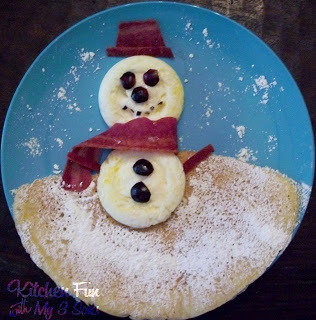 We used 2 poached eggs, turkey bacon, 1 large pancake, powder sugar, and dark grapes. We poached our eggs in the microwave and flipped them oven on the plate when they were done. We made our pancake on the rounded bottom part of the pan so it would fit on the bottom of the plate. We cut the top with kitchen scissors to look hilly. We made turkey bacon and used 1 strip for a scarf and cut another strip for the hat and arms. We cut a couple of dark grapes to make the buttons and face (you coule just use chocolate chips or raisins). We sifted a little bit of powder sugar on the pancake and sky for the snow. My boys were bummed out that we forgot his pipe, but we still think he turned out really cute! « Previous PostYork Peppermint Patty Penguin Pops! Next Post » Christmas S’mores Boy & Girl Pops! 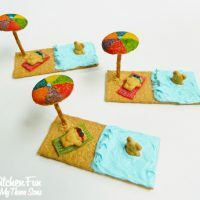 Teddy Bear Beach Party Treats & Snacks including a Free Printable! THis is way cute!! LOVE it! I love this idea! I just wonder if my son would like the egg poached? Hmm.. A must try regardless! You have the cutest ideas!! 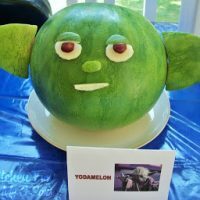 I wish I could be that creative. The best healthy meals you can give your kids are ones they can have fun making and eating! It's good quality time together too! Oh my gosh! Totally adorable!!! Such a cute idea! 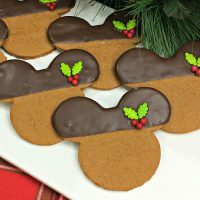 I think I'll do a themed breakfast for my kids Christmas eve. I'll just surprise them! What a cute little snowman 🙂 stopping by from ABC and 123 Show and Tell and am your newest follower. love this one! definitely gonna try! So awesome. These are on my to-do list now. Also, because my site is all about playing with food, too, then I'm subscribed and stalking you now, hehe. Please link this post to my Christmas Traditions link up in the Recipe section! It starts today! featured button on your site, you can grab one from the right side bar of your post above. Your posts are so fabulous!!! Lots of sites post ideas like these but yours just have something extra!!!!! Thanks for sharing!